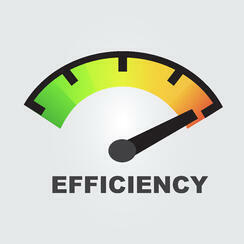 An efficient office workflow can lead to an increase in patients and profits. Unfortunately, there are many things in an optometric practice that can impede your ability to optimize your office workflow. This post explains how you can tell if your office workflow is delaying your practice’s ability to move patients through the appointment effectively and how you can improve it. Using appointment books to manage your patient schedule damages your office workflow. Appointment books usually don’t have enough room to display all the information your staff will need on a patient. However, using a web-based scheduler that’s connected to your practice management solution, your staff can more effectively schedule appointments. Also, if the scheduler is integrated into the patient portal, your patients can view open timeslots to check availability and schedule appointments without calling your office. Reminding your patients to come back to your office for a follow-up exam or to remind them of an annual appointment can be time-consuming. Traditional methods like having your staff call each patient individually or sending postcards not only is a significant time commitment, but it can also keep your front office staff from interacting with the patients present in your practice. With your practice management software, you can configure automated patient recall messages that send either texts or emails to your patient based on their preferred communication method. Another sign that your office workflow needs a tune-up is if your staff is calling payers to check eligibility. A claims management solution integrated into your practice management system allows you to check patient eligibility without getting on the phone with payers or switching between multiple payer sites. Also, with real-time updates, you can provide patients with an accurate estimate of how much of the payment the patient will be responsible for before the exam. No one likes to wait. Handing a patient a clipboard with paper forms to fill out in the waiting room not only aggravates your patients, but it also slows down your office workflow and could lead to data entry errors. To reduce data entry errors and accelerate your office workflow, encourage your patients to use a patient portal where they can fill out electronic copies of the forms and securely transfer them into the practice management and EHR solution. Many of the pre-test screenings that you as the OD traditionally perform can be offloaded to your technician and then synced to the EHR. When you transfer the pre-tests to your technician, you open the opportunity for your practice to see more patients and allow yourself to spend more time on the actual exam and not on mundane tests. Looking for other ways to improve your workflow efficiency? Download our ebook for optimizing your office workflow.